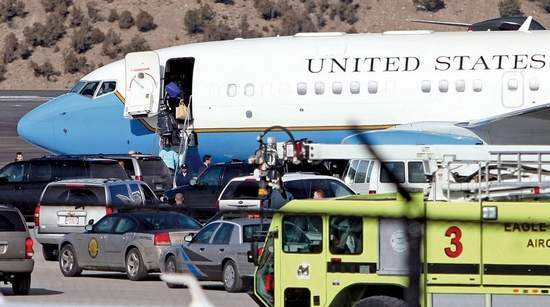 Dominique Taylor/Vail DailySecurity, including local law enforcement officers and Secret Service agents, surround a Boeing C-32 plane as the Obama family and their entourage board Monday at the Eagle County Regional Airport in Gypsum, ending their Presidents Day weekend ski vacation in Vail. VAIL, Colo. – Michelle Obama had at least five options for weekend destinations, but insisted on Vail, sources told the Vail Daily. The first lady and her daughters were among those who packed up and headed for home Monday, closing out a busy Presidents Day weekend in the Vail Valley. Michelle Obama’s press secretary issued a statement Saturday that the family is picking up the tab for personal expenses. Sources say that because Obama was largely paying her own way, she insisted on the final say. Those same sources say that the Obamas were “down to earth,” enjoyed their stay and could not have been nicer. The first lady, daughters Sasha and Malia and some of Mrs. Obama’s friends landed at the Eagle County Regional Airport Friday night about 8 p.m., flying in a Boeing C-32. It remained on the tarmac all weekend, obscured from view behind two Vail Valley Jet Center hangars, before leaving for Andrews Air Force Base about 3:30 p.m. Monday. It was their first trip to Vail, but not their first time on skis. The first lady took her daughters skiing last year at Liberty Mountain Resort in Carroll Valley, Pa.
Vice President Joe Biden spent the Presidents Day weekend in the Florida Keys. Biden stopped by the Vail Valley last winter for a weekend trip to Beaver Creek. President Obama remained in Washington for the weekend. Besides his official duties, he coached Sasha’s basketball team Saturday morning, while Sasha was skiing in Vail. The first lady’s stop in Vail created quite a buzz around town. One savvy commenter asked if this was a bi-partisan vacation, since Aspen usually gets the Democrats and Vail gets the Republicans. A few wished them well, while many asked how much all this was costing America’s taxpayers. Some pointed out that because they are who they are, there’s no other way the first lady and her daughters can travel. They also brought with them a sizable contingent of Secret Service personnel, although not nearly as many as Biden did last year. In the mid-1980s, a Middle Eastern king brought the biggest security force most people around here can remember. “The biggest on-mountain skiing security force I ever saw was at the Beav’ when Jordan’s King Hussein vacationed in the valley,” said Jeff Beavers, who used to help coordinate this sort of thing with the Eagle County Sheriff’s Office.